The Main Idea Belt is an engaging and adaptable extension project for all grades. 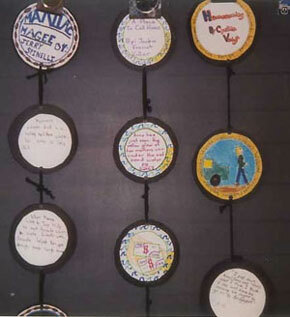 The “belt” consists of a series of paper circles on which students draw representative scenes. The project is an effective way for students to summarize the plot, describe character development, or synthesize the major issues represented in a book. 1. After students have finished reading a book, have them brainstorm five significant events in the plot (or five stages of character development). 2. Using cups or a compass (or any circular object), trace six “larger” circles on black paper and twelve “smaller: circles on white paper. The exact sizes are not critical; the white circles should fit inside the black ones. Cut these out. 3. Glue a white circle to each side of each black circle. 4. Have students think of a symbol to use as a border around the edge of one of the white circles on each disk. 5. On the first disk, write the title and author of the book inside the symbolic border. On the back the student writes his or her name. 6. On the remaining five disks, create an illustration inside the symbolic border to depict each of the main events. 7. On the back of each of these disks write a sentence to describe the main event and another sentence to explain its importance to the story. As you can see in the photos below, the Main Idea Belts can be strung together with yarn or string and hung on the wall or bulletin board. 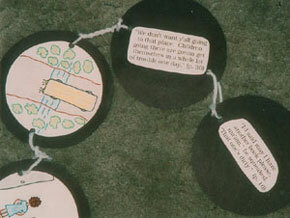 The example below on the left (from Roll of Thunder, Hear My Cry by Mildred Taylor) shows a close-up of belt segments with images on one side and illustrative quotes from the book on the other. The example on the right shows three main idea belts based on Maniac Magee by Jerry Spinelli, A Place to Call Home by Jackie French Coller, and Homecoming by Cynthia Voigt.